GRID – teaser from TETRO on Vimeo. Christopher Bauder (White Void) has built a rich body of work developing the medium of kinetic lighting, sending aloft lit orbs and balloons, in dazzling arrays of moving objects. And some of the best collaborations have been with master electronic composer Robert Henke, not only synchronizing sound but aligning process and pattern in each. GRID, the latest Bauder/Henke work, takes the scale of these investigation to a new peak. 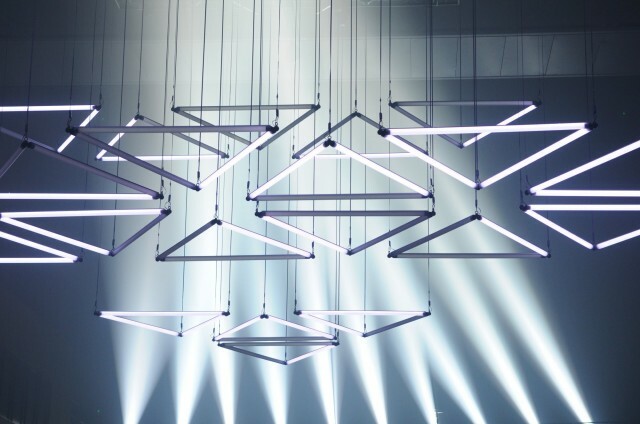 Some 150 light bars, each of them a custom-built LED fixture, are hung in a triangular grid and are suspended by motorized winches. 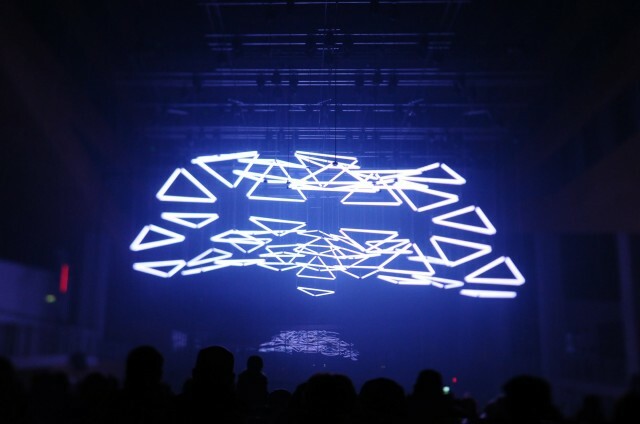 Using original software built with TouchDesigner, they can choreograph elaborate patterns and dances, forming the lights into sets of triangles and undulating waves. The entire setup is controlled graphically, allowing fluid assembly of presets and cues. I got the chance to visit Christopher in his studio as he prepped for GRID’s debut this week in Lyon. It’s worth noting the intimacy with which music and image are arranged: Henke’s score in Ableton Live is replete with details in timing and parameters that make explicit connections between sound and light. Photos: Andrea Aubert, for Tetro. The winches themselves are terrifically powerful, too. Bauder said his team actually had to scale back some of the speed, lest it seem like the plunging lights, all at once, were about to drop on a viewer’s head. But the effect is beautiful, organic as much as mechanical. 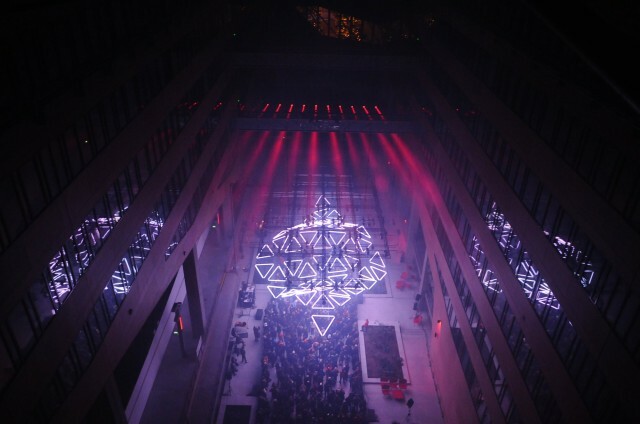 And it’s not only the installation itself that found an epic scale: Lyon, for this week’s Fête des Lumières, made the event itself something grand. 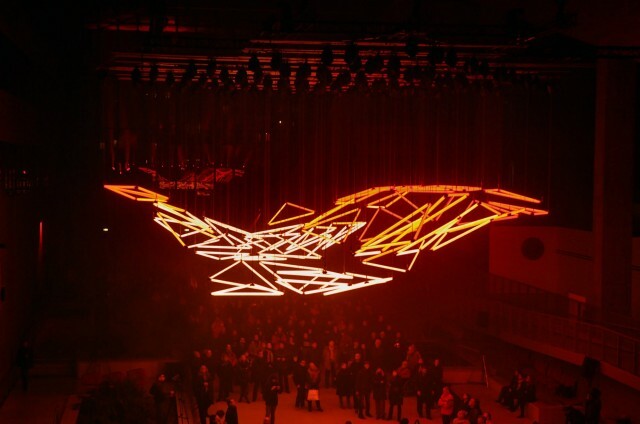 Nearly 22,000 people filed through the installation, and were treated not only to Henke’s electronic score, but also a 45-person choir singing Bach, the 22-meter (72-ft) array floating in the air. The patterns, while minimal, also take on a variety of characters, from futuristic geomteric visual poetry to gentle waves as if the entire array were some sort of alien sea creature. The project is adaptable to other content; even the arrangement in triangles can (and is) swapped for other configurations. So I hope we get to see more both of this work and the system it employs. I expect we’ll also have more documentation, so expect a follow up – and please, do feel free to ask questions, as we can pass them along. And you can navigate other White Void kinetic light projects on their site.